Uncommon permanent resident that ranges from southeastern deserts northwest throughout the Central Valley and along the inner Coast Ranges and Sierra Nevada. Distributed from annual grasslands to alpine meadows, but associated primarily with perennial grasslands, savannahs, rangeland, some agricultural fields, and desert scrub areas. Mostly absent from northern coastal fog belt. Not found in upper elevations of Sierra Nevada. Feeding: Eats mostly small mammals, some small birds, and reptiles. Catches prey in air and on ground in open areas. Dives from a perch with rapid pursuit, or dives from searching flight 15-90 m (50-300 ft) above ground. Cover: Requires sheltered cliff ledges for cover. Reproduction: Usually nests in a scrape on a sheltered ledge of a cliff overlooking a large, open area. Sometimes nests on old raven or eagle stick nest on cliff, bluff, or rock outcrop. Aerial courtship display occurs near nest site. Southeast-facing nest site apparently preferred, but height and orientation secondary to nature and character of the ledge. Water: Denton (1975) reported 76% of eyries had water within 0.4 km (0.25 mi). Reported bathing (Skinner 1983a). Captive individuals drink irregularly (Steenhof, 1998). Pattern: Uses open terrain for foraging; nests in open terrain with canyons, cliffs, escarpments, and rock outcrops. Activity Patterns: Yearlong, diurnal activity. Much time spent perching near eyrie. Forages mostly early morning and late afternoon except when feeding nestlings or prey scarce. Seasonal Movements/Migration: Migrants from north winter in California. Some residents wander upslope in summer and downslope for winter. Home Range: Home range of a breeding pair was 26 km² (10 mi²) in Wyoming (Craighead and Craighead 1956). In California average home range size ranged from 59-288 km² (Harmata 1978, Haak 19982). Territory: Territory and home range probably the same. Intensively defends territory but less so on the wintering grounds (Steenhoff 1998). Breeding territory was 5.7 to 6.5 km² (2.2 to 2.5 mi²) in Utah (Smith and Murphy 1973). Active nests have been recorded within 200 m (636 ft) of one another (Enderson 1964, Garrett and Mitchell 1973), in sites where individuals did not confront or see each other regularly. Thus, relative orientation of potential nest site probably more important than actual distance from another potential site. Reproduction: Breeds from mid-February through mid-September, with peak April to early August. Clutch size 3-6 eggs, average 5. Mean laying date for 280 records 1900-1977 was April 4-11 (Walton 1977). Fledging success over 5 yr for 135 nests averaged 3.2 young, ranging 0-5; 19% of the nests had 5 young (Walton 1977). Young begin to disperse in June and July. May live as long as 13-20 yr (Enderson 1969, Denton 1975). Niche: Vulnerable to DDE poisoning. Egg and nestling predation occurs at sites accessible to mammal predators, great horned owls, and golden eagles. May compete with red-tailed hawks for food and nest sites, and with great horned owls and ravens for nest sites. Brown, L., and D. Amadon. 1968. Eagles, hawks and falcons of the world. 2 Vols. Country Life Books, London. 945pp. Craighead, J. J., and F. C. Craighead, Jr. 1956. Hawks, owls and wildlife. Stackpole Books, Harrisburg, PA. 443pp. Denton, S. J. 1975. Status of prairie falcons breeding in Oregon. M.S. Thesis, Oregon State Univ., Corvallis. 58pp. Enderson, J. H. 1964. A study of the prairie falcon in the central Rocky Mountain region. Auk 81:332-352. Enderson, J. H. 1969. Peregrine and prairie falcon life tables based on band recovery data. Pages 505-509 in J. J. Hickley, ed. Peregrine falcon populations. Univ. Wisconsin Press. Madison. 596pp. Garrett, R. L., and D. J. Mitchell. 1973. 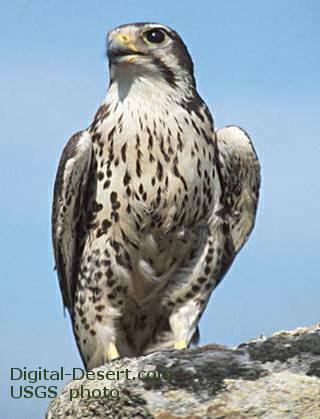 A study of prairie falcon populations in California. Calif. Dep. Fish and Game, Sacramento. Admin. Rep. 73-2. 15pp. Haak, B. A. 1982. Foraging ecology of Prairie Falcons in northern California. Master's thesis Oregon State Univ., Corvallis. Harmata, A. R., J. E. Durr, and H. Geduldig. 1978. Home range, activity patterns, and habitat use of Prairie Falcons nesting in Mojave Desert. Unpubl. rep., Colorado Wildl. Services, Fort Collins, CO for U.S. Dept. Inter. Bur. Land Manage., Riverside, CA (contact No. YA-512-CT8-4389) Remsen, J. V., Jr. 1978. Bird species of special concern in California. Calif. Dep. Fish and Game, Sacramento. Wildl. Manage. Admin. Rep. No. 78-1. 54pp. Skinner, M. P. 1938a. Falco mexicanus Schlegel: Prairie falcon. Pages 18-42 in A. C. Bent. Life histories of North American birds of prey. Part II. U.S. Natl. Mus. Bull. No. 170. 482pp. Smith, D. G., and J. R. Murphy. 1973. Breeding ecology of raptors in the eastern Great Basin of Utah. Brigham Young Univ., Provo. Sci. Bull. Biol. Ser. 18, No. 3. 76pp. Snow, C. 1974b. Prairie falcon, Falco mexicanus. U.S. Dep. Inter., Bur. Land Manage., Wash. DC. Habitat Manage. Ser. Rep. No. 8. 18pp. Steenhof, K. 1998. Prairie Falcon (Falco mexicanus) In, The Birds of North America, No. 346 (A. Poole and F. Gill, eds.). The Birds of North America, Inc., Philadelphia, PA. U.S. Bureau of Land Management. 1979. Snake River birds of prey special research report. U.S. Dep. Inter., Bur. Land Manage., Boise, ID. 142pp. Walton, B. J. 1977. Development of techniques for raptor management with emphasis on the peregrine falcon. Calif. Dep. Fish and Game, Sacramento. Admin. Rep. 77-4. 26pp. B131 Life history accounts for species in the California Wildlife Habitat Relationships (CWHR) System were originally published in: Zeiner, D.C., W.F.Laudenslayer, Jr., K.E. Mayer, and M. White, eds. 1988-1990. California's Wildlife. Vol. I-III. California Depart. of Fish and Game, Sacramento, California. Updates are noted in accounts that have been added or edited since original publication.